Different payment and deposit methods. The 888sport company is very modern and well-managed in many respects, although its odds offer is not attractive (apart from the Premier League, where odds of British bookmakers are always best). 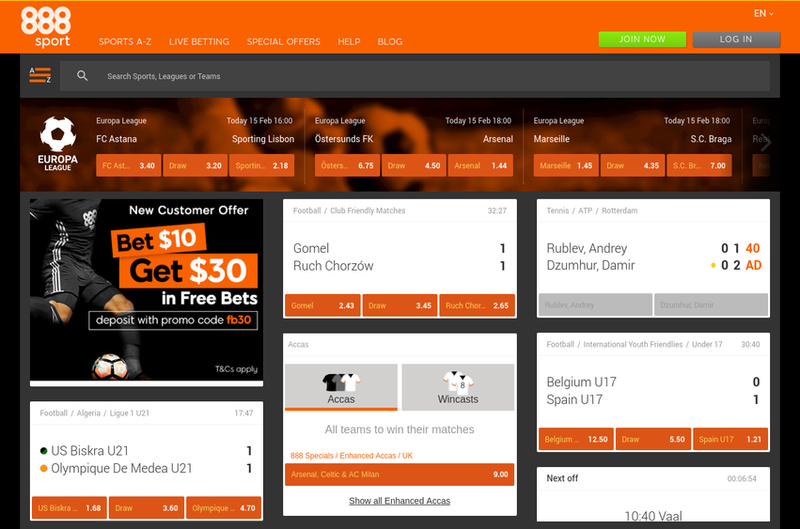 The elements in respect of which this betting company has been in the lead from the very beginning of its operations include the Internet presence but also very modern methods for accepting users’ payments. In the case of both making deposits, when a player pays funds to their account in order to make bets later, and withdrawing funds from an account in the event of winnings, the company works very fast. 888sport uses most modern forms of payment, most of which are, of course, online payments. In addition to instant payment systems, bank checks and PayPal, YetiPay or BlueCash payments are also acceptable. Naturally, the user also has the option of making a normal cash payment to the recipient’s account by providing relevant data in the payment title on a generated payment form accepted in bank facilities or post offices. Of course, a player who wants to withdraw funds from their account must meet several specific conditions, which are pre-determined and made available by the bookmaker at every stage of participation in the game.